It's a quiz question likely to have your pals down the pub scratching their heads. Which English city is the birthplace of four world boxing champions? The men in question, Ben Brain, Jem Belcher, Henry Pearce and Tom Cribb, were all bare-knuckle fighters, once the most famous sporting celebrities in the land and held in high esteem from the poorest labourer to the king himself. All four were, as this book's title indicates, born in Bristol, though astonishingly, there is no monument to their sporting prowess to be found anywhere in the city. In London, the Tom Cribb pub displays a plaque stating that the champion once lived there and his tomb can be found at Woolwich churchyard, but none of the quartet are honoured in their home town. Cribb was the most famous of all, ostensibly because he was involved in two of the greatest bare-knuckle fights in history against Tom Molineaux, an African-American slave who had secured his freedom with his fists. The two battles they fought, both in the early nineteenth century, were watched by thousands. Victory turned Cribb into a national hero. He became a great favourite of the Prince Regent, later George IV, and in 1814 was invited to give an exhibition of sparring to the King of Prussia. At George's coronation in 1821, he acted as a page, guarding the entrance to Westminster Hall. The other three have equally fascinating tales - and great nicknames. Brain was known as 'The Napoleon of the Ring' because of his likeness to the French emperor, while Pearce was referred to as Henry 'The Game Chicken' Pearce. Read the book to find out why. 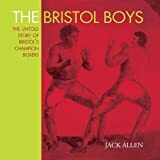 Jack Allen has produced a compelling sports book, reminding readers of boxing's enormous popularity, especially between 1780-1820 when crowds of more than 40,000 were the norm at championship bouts. Fights were brutal affairs, fought with 'the raw 'uns' (bare fists) against a backdrop of frenzied betting. Incredibly, there was no limit to the number of rounds the boxers fought, which meant fights could last for more than an hour, ending only when one of the pugilists failed to come up to scratch or signalled his retirement. It was not until 1869 that the Marquis of Queensberry introduced rules that insisted on fighters wearing padded gloves and three-minute rounds. To our pampered, early twenty-first century sensibilities, bare-knuckle fighting is an anomaly and it is perhaps our squeamishness which accounts for the absence of a monument to Bristol's brave world champion quartet. But the brutality and bloodshed of bare knuckle fighting should not prevent sports fans from digesting this marvellous book. In Bristol itself, a campaign has started to have these four men, who brought such fame and honour to the city, officially recognised either with a statue or a plaque. Once you've read The Bristol Boys, you will understand why.